Right now in the food community one of the hot topics is sort of about ‘disconnect,’ that is, despite some of the amazing (including healthy foods) being shared, the sensational public appetite for new foods, along with the surge in food television programming, still, folks really aren’t so much cooking these dishes at home. There are likely as many reasons as the number of stars in the sky on this indicated wonder, including at minimum that some presented dishes have just gone way over the top and too, recognition that there is a big difference between ‘chef cooking’ and ‘home cooking.’ You might even have some of your own thoughts and opinions on this food trending topic. One focus that most intrigues me though is relative to diverse food preparations, mainly the introduction and use of new ingredients. Well, not really new ingredients but rather age old ingredients that have been eaten as part of a mainstream diet in certain parts of the world and then, through any among many channels from immigration to cookbook writing to food industry snack foods become newly introduced to a different population. Since Mediterranean hummus has taken off in a stellar fashion settling into the commonplace, I am currently now curious on the future ingredient popularity of the very tasty Mediterranean spice blend, Za’atar, which I am sharing with you today in the dish: Grilled Lamb, Za’atar Flatbread, Marzano Tomatoes, Herbs, Feta. Perhaps you even know Za’atar and like it but have never sought it out to buy and use, or perhaps it has even become a standard in your pantry that you sprinkle on in a diverse variety of uses. I first tasted Za’atar, some years back at a religious studies class where displayed on a buffet spread were food items that Jesus would most likely have eaten. Naturally, being a person that loves to try new foods I took great spiritual delight dipping pieces of pita bread into a small bowl of Za’atar covered with olive oil. The flavor was fabulous and unique, but not so much so that it took any great acclimation, one might even equate a similarity not so much in taste, but in style of dipping a slice of Italian bread into a bowl of olive oil with some oregano, salt and pepper. Za’atar is simply a different spice combination. Perhaps then what and how we use ingredients and prepare our dishes at home also relates to how they are introduced or shared with us, and even if there is something of similarity that we might compare it to. Whether or not Za’atar will become commonplace as hummus, soy sauce, salsa, and Sriracha have become it remains to be seen, but I do hope you will give it a try and prepare some dishes with it at home, like this simple warm weather open-face of Grilled Lamb, Za’atar Flatbread, Marzano Tomatoes, Herbs, Feta, or simply use it just as a dip in some olive oil served with any type of flatbread. You can also sprinkle Za’atar on chicken or fish, on pizza, in salad dressings, even a top of grain and vegetable dishes, but anyway you use it, most of all, hope you enjoy. 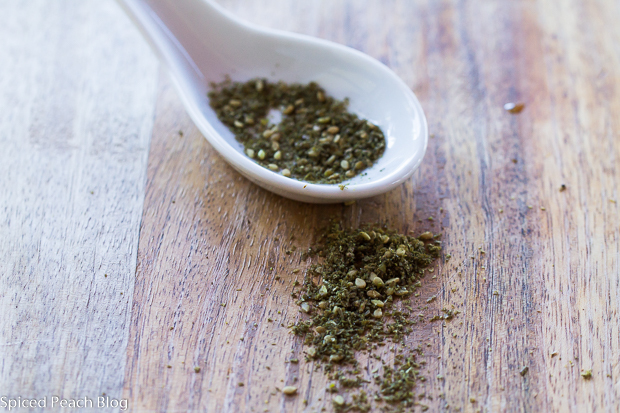 Za’atar may be found at any Lebanese or Middle Eastern market, many international markets, and online. Mix spices in small bowl. Do not rinse lamb in water. Pat away any moisture on lamb with paper toweling, sprinkle over the spices rubbing into meat covering all around. Let lamb sit at room temperature at least 30 minutes, halfway through, preheat gas grill on medium high heat. Place lamb onto grill and close lid, grill for 7 minutes before turning over. Turn lamb, cook another 5-7 minutes, more or less, to medium rare depending on grill. Transfer meat to a platter, tent with aluminum foil for ten-fifteen minutes before thinly slicing on the diagonal. 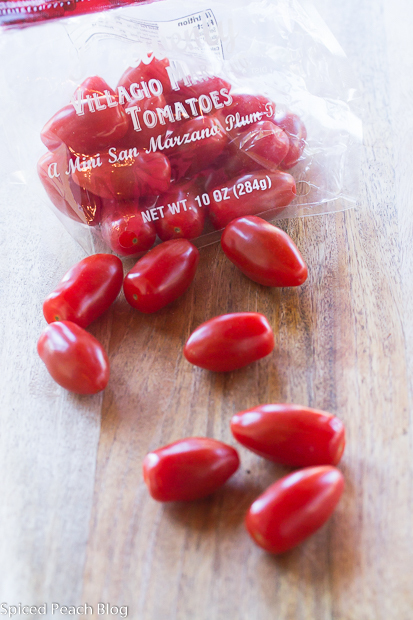 Lightly stir together the Marzano tomatoes, feta, and onion, sprinkle in salt and pepper before folding through the oregano and parsley. 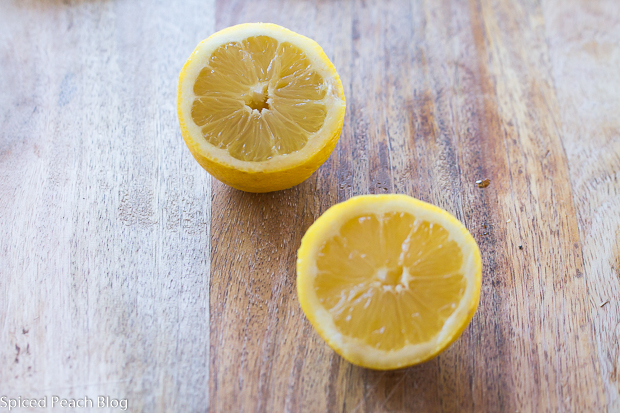 Whisk together the lemon juice and olive oil with a pinch of salt and pepper, pour over the tomato feta salad, stir. Let salad sit. Brush each flatbread with some olive oil all around the circumference then sprinkle on the zaatar. Bake flatbread zaatar at 350 degrees for around 5-8 minutes until softened and warmed through. 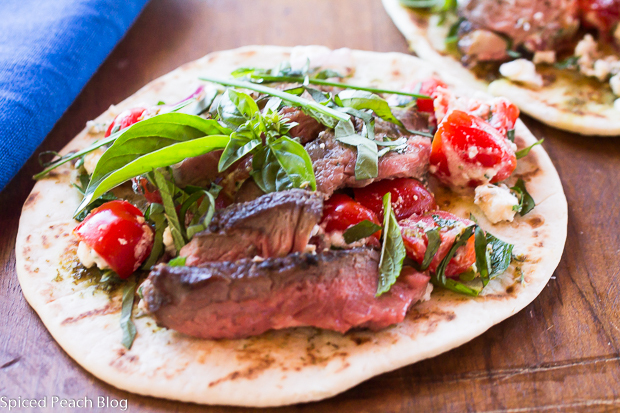 Top flatbreads with Tomato Feta salad, slices of lamb, finishing with fresh basil and mint strips. 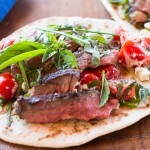 This entry was posted in Lamb, Sandwiches and tagged Grilled Lamb, Grilled Lamb on zaatar Flatbreads with Marzano Tomatoes Fresh Herbs and Feta, Grilled Lamb Zaatar Flatbreads Marzano Tomatoes Herbs Feta, Grilled Lamb Zaatar Flatbreads Marzano Tomatoes Herbs Feta Recipe. Bookmark the permalink. Post a comment or leave a trackback: Trackback URL. Thank You Meredith! Big Hugs. I have never had Za’atar, but I do enjoy lamb. This looks delicious, Peggy. What a fun summer supper. Hi Kelly! So funny to see your comment pop-up just when I was approving comments, what kind of timing is that?!!! Za’atar is so delicious Kelly and so unique to a typical spice blend you might typically find or mix together. I love lamb too, and a medium rare grilling makes it so juicy and flavorful. Thanks much and see you soon! 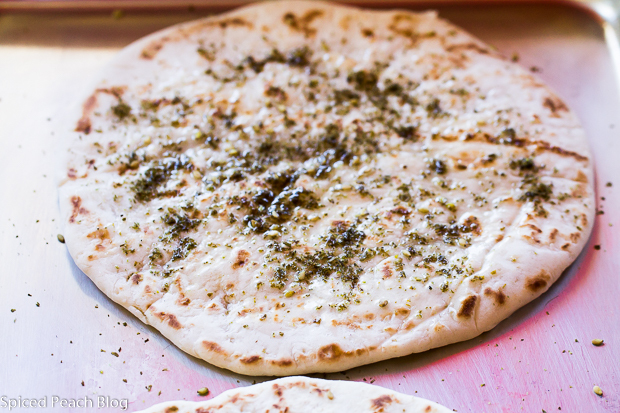 I love flatbreads with olive oil and Parmesan cheese, the Za’atar sounds delicious and worth a try. The lamb looks mouthwatering too! Thanks Joanne! I can give you a little baggie of it to try next time we see each other. Hope all is well and thanks much for stopping by! Love lamb and flatbread so I got try your recipe! Thank you, Peggy. Thank You Jolma! I hope you try it and am sure you will enjoy it! See you soon on Beyond Her Kitchen! 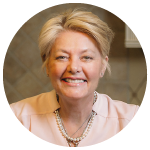 Dear Peggy, this sounds like a wonderful recipe with all the kind of ingredient I love – za’atar being one of them. Cooking a lot from the talented Mr. Ottolenghi these days, I believe I am no stranger to these kinds of amazing flavors and flavor combinations. Hi Andrea, thanks much. Yes, I’ve of course, been following some of your selections from Mr. Ottolenghi which have been sensational, as always! It is such a pleasure in life to be open to trying so many different ingredients, flavors, and cuisines- a spice of life! See you soon. Big Hugs, Peggy. 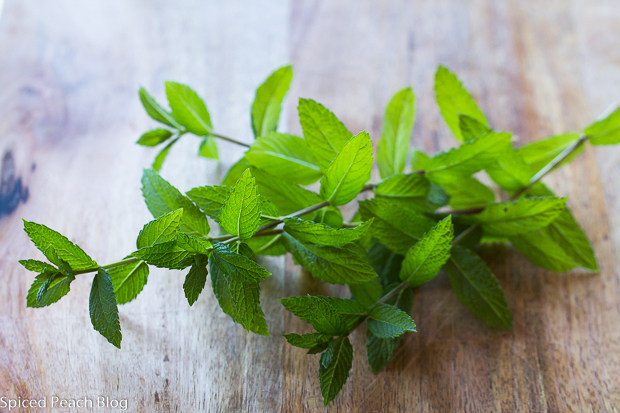 Za’atar is one of my favorite spices Peggy, love how you used it here. Beautiful dish! Thanks Cheri, I think za’atar has become one of my favorite spices too, especially among those that stand alone within a dish! Hope the summer is continuing along with lots of fun and exploration! See you soon. This sounds like a wonderful summer dish! I’m a fan of za’atar and suspect that it’s going to become a familiar kitchen staple for more people in North America. I think people’s love affair with cooking shows doesn’t necessarily help get them into the kitchen. There’s some that are too intricate and others that are unappealingly simple. Ultimately, I think time with a few well-written cookbooks can help much more. Hi Teresa! Thanks so much and I hope you enjoy! I love za’atar too and hope it does become more of a kitchen staple in households. Agreed on cooking shows, they are fun and entertaining but it is true in that this does not follow on getting folks to actually cook in their kitchens. And of course, we both love cookbooks as do many of our online friends!